Lynn Dwyer, a professional artist for over twenty years, brings experience in many mediums as well as teaching experience for adults and children in primitive clay handbuilding. Spiritual work through the creative process is well-documented as powerful self-discovery work, breaking through barriers, and caressing the underlying aspects of our nature that many times we have stuffed or that we may have not even met before. It's a worthy therapy that will leave you wanting more. No experience necessary - beginners LOVE IT. 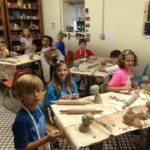 Lynn has taught art to a variety of populations of folks; from children to adults, from physically disabled to mentally disabled, and most without any prior knowledge or experience with clay. 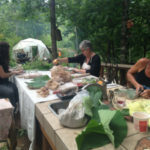 See how a two hour workshop during your retreat will really add to your experience. Try a powerful Mask workshop after a guided meditation. You won't be disappointed. Oh, the places you can go! See Samples of Lynn's work on her website, More Than Mudpies. Workshop Prices include ALL MATERIALS, Necessary Firings, Tools. Outdoor Gathering/Teaching Space as well as indoor tabled areas available for use. We also have access to a variety of other artists, and mediums. Should you want something specific, please do not hesitate to ask. We are surrounded by creative people willing to share their gifts, and we can set it up.